At Discover Dental, we get a lot of questions about the Invisalign dental aligners system. Most Houstonians near our office here in the Heights know that Invisalign straightens teeth just like regular braces, and that Invisalign aligners are clear, fit over your teeth, and are removable. Typically, however, that’s about where the common knowledge ends! 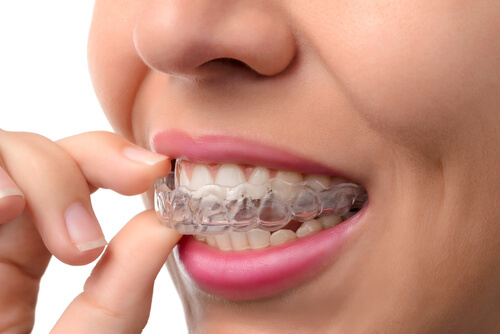 Invisalign aligners are made of a thermoplastic material. That means they’re safe to wear in your mouth! They aren’t really invisable, but they are translucent—not quite clear, but you can still see through them. They look somewhat similar to teeth-whitening trays. Invisalign aligners are custom-made for you and only you to move your teeth in the sequence determined by your dentist. Will people know that I’m wearing Invisalign? Some will, especially if they’ve used Invisalign themselves. But most people will never realize that you’re wearing Invisalign aligners unless you tell them or show them! They are much, much harder to spot than traditional braces. It’s recommended that you wear Invisalign between 20–22 hours per day. Yes, that means they are meant to be worn while you sleep! How long it takes to accomplish your specific orthodontic goals varies from patient to patient, but most patients commit to wearing Invisalign for at least a year. Invisalign is designed to be much less painful than traditional braces. Some people experience temporary discomfort for a day or more when they receive a new set of aligners. Most describe it as a feeling of pressure and find that it can be treated with asprin. This is normal, and it’s a sign that Invisalign is working! Can I eat with the aligners in my mouth? No! Invisalign is designed to be removed while you eat or chew. Medical benefits differ significantly from policy to policy. Review your personal coverage plan, or call Discover Dental for a free consultation! Typically, if a patient has orthodontic coverage, Invisalign should be covered to the same extent as conventional braces. We can’t say for sure until we get a good look at your teeth! Call Discover Dental today and book an appointment for a free consultation about Invisalign. Or just come in for a regular checkup! We’re conveniently located in the Houston Heights, and we look forward to seeing you!